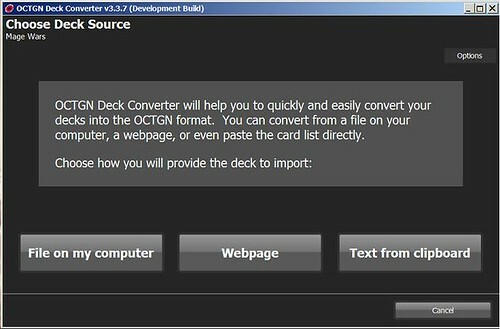 When you open up the OCTGN Deck Converter plugin you have three ways to import data. The text file export from the Arcane Wonders Mage Wars Spellbook Builder. This is not the sbb output by saving the spell book, but is under the Export | Text Menu. The text file from the native export from OCTGN. Webpage: You can use a URL to any of the forums BBCode based spellbooks. Note if multiple spellbooks are on the same webpage it will only import the first spellbook it finds. Here is a link to Schwenkgott’s Adramelech Face Melter spellbook on the forums. If you use this URL in the converter you will be able to use it (or use it a start point) in OCTGN. Text from Clipboard: You can copy and paste from the web site into each category: Attack, Conjuration, etc. Count has to be leading.